Back in the 80’s DE Engineers Founder: Des Prater developed the first self feeding cattle feeder which allowed stock to nudge one of the six sliding doors to let feed slide down into the tray. This innovative idea reduced the amount of feed wasted and extended the life of the feed tray as very little feed was left to waste. These original Yellow feeders are still in use today with the later versions using a floating ring suspended on chains that the cattle nudge to attain feed. This floating ring was later adapted to our range of self feeders for sheep because the feeds gap on all round feeders could not be easily adjusted as the entire body (often full of feed) needed to be raised to do so. 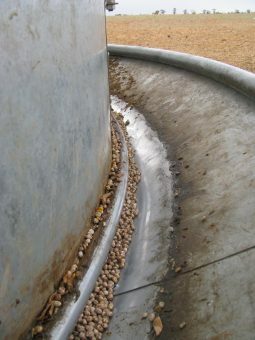 With the introduction of “Lick Feeders” the feed ring on our Ultimate range of self feeders was modified so it could be adjusted with bolts to suit the amount of feed required and with ‘on farm design’ the feed tray was also modified to form a “Vee” shaped gap that stock have to lick from when feeding. 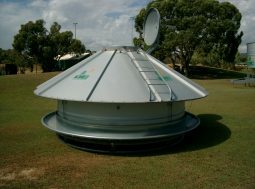 This unique feeder reduces the amount of feed in the tray minimizing wastage and the amount of feed used (by around 50%) while extending the life of the tray. Our range of sheep feeders are guaranteed to be the strongest sheep feeders manufactured from from longer lasting 40nb galvanized pipe, have a ‘Lick style” feed ring which is adjustable to suit lot feeding and are easy to move with skids and fork shoes are available. 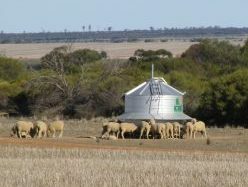 Our sheep feeders offer the largest feed trough circumference and are recommended to feed up to 200 head of sheep per feeder. 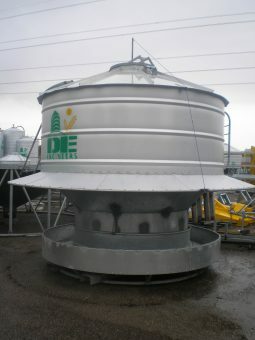 Huge savings on feed has prompted our 3 barrel feeders to now become one of our biggest exports to the Eastern States. The most efficient feed tray. 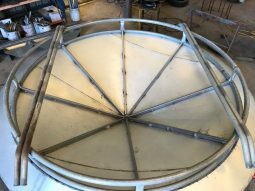 The ‘lick style’ feed ring stops sheep from overfeeding while saving feed on spillage by forcing sheep to use their tongue to access feed from a ‘vee’ shaped gap formed between the angled tray and adjustable feed ring. This unique design stops sheep from standing on the feed and will also work well with pellets. 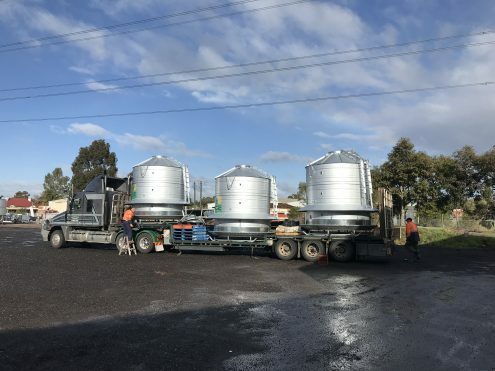 Because of the limited amount of food left in the feed tray extra rain guards are not usually necessary but steel removable rain guards are available and are supplied to be installed on farm so the feeders do not need a pilot vehicle during transport. 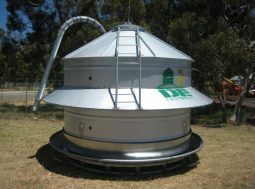 Only DE Engineers sheep feeders are build with stiffeners under the base cone so they can be filled with the extra weight whole grains including lupins. The base frame is made from longer lasting galvanised pipe (not square tube). Our small cattle feeders are ideal for feeding calves and can be fitted with an optional feed blow in tube. 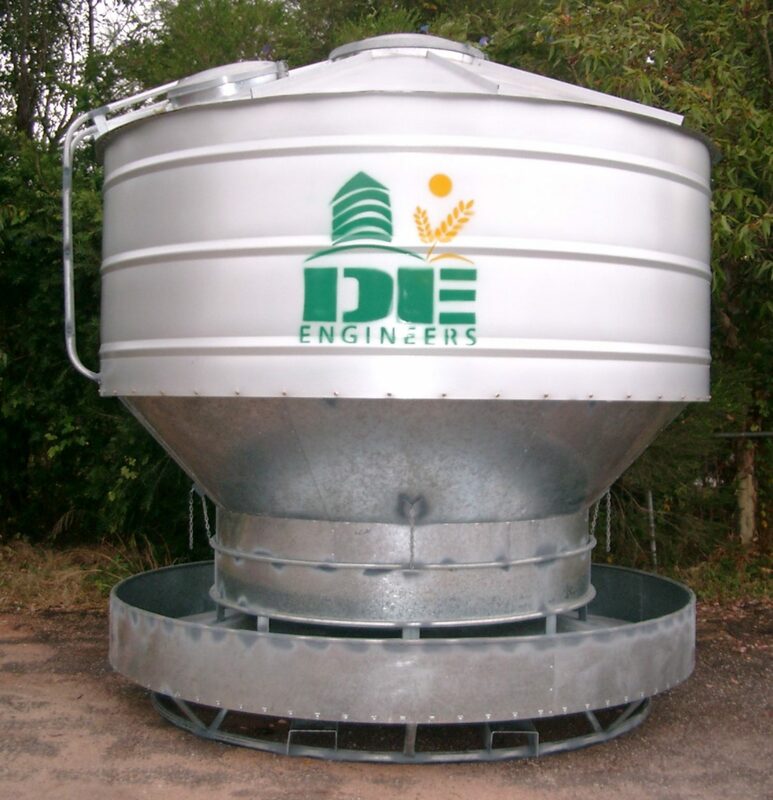 D E Engineers “Cattle Feeder” work by allowing cattle to nudge the feed ring to allow feed into the feed tray. This means the cattle keep the feed tray empty, eliminating rotten feed and rusted feed trays. Recommended for between 60-90 head of cattle. 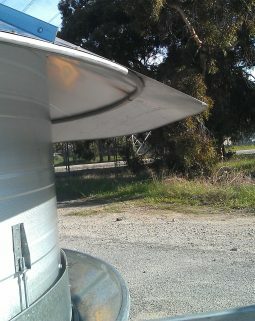 Rain guards are extra and are supplied to be installed on farm so the feeders do not need a pilot vehicle during transport.